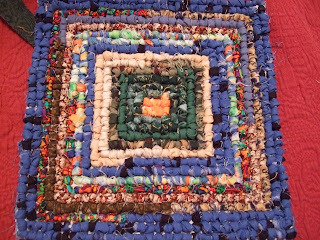 Looking for ONE more way to use up those scraps that multiply on their own? (don't leave them alone in a dark closet!) In my studio there are two last stops on the way to the dog bed scrap bag. I am cutting for yoyos, but have nothing to show for it. I have a ziploc bag with circles awaiting the day when I'm REALLY stuck for something mindless to work on. That day has not arrived yet...but it WILL I'm sure. The other 'scrap user' is locker hooking. 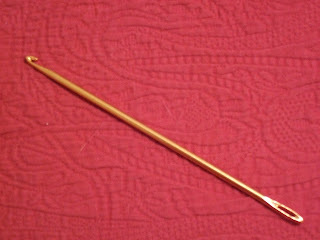 Here is a picture of a trivet I made as a trial piece. There is no pattern for this. I just used strips I had in my scrap drawer. 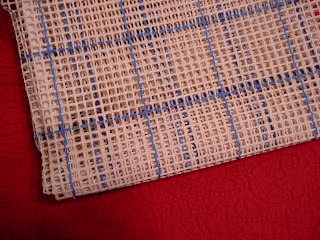 You use the hook end to pull up strips of fabric, leaving a loop sticking thru the canvas. 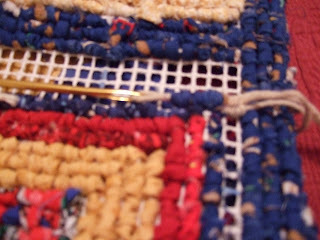 When you have 3 or 4 loops on the hook, you pull a cotton yarn or cord that is threaded on the eye end throught the loops. This keeps the loops from pulling back out on the back. I'm sorry for the out of focus pictures. I have not quite figured out this camera! Closeups seem to be a bit harder than I thought. I think you can see what I'm demonstrating tho. ( I HOPE). 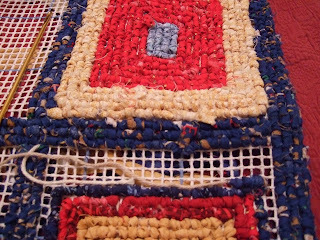 Here is the rug I'm working on in my kitchen colors of red, yellow and blue. SOMEDAY it will live by the sink! In the mean time, I have a take along project just in time for baseball season. (yes we have already had tryouts...1st team meeting...and are up for the 2nd practice tonight. Ready or not, here it comes!) Spring training is in full swing here in AZ...and we had a high today of 80. We will enjoy it while it lasts...as that means that HEAT is not too far behind. Let me know if you need pictures of how to join the fabrics. 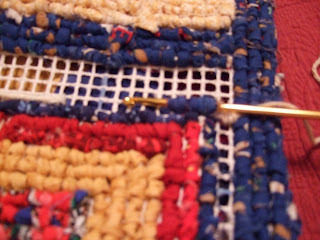 The cotton yarn is just tied on to the canvas to start, then I tie it to itself and trim the ends real close. Hey, that's cool! I've always wondered how that's done. Great tutorial -- TY! Yes, please post those pics, too. My friend Adele does this and loves it. Looks really fun, so I'd like to try it. I'd heard the term, but apparently didn't understand the concept. Thanks so much for the pictures and explanation. They certainly explain it. Your trivet is great. Another thing to add to the to-do list. I meant rug and not trivet. Glad you're feeling better, Beth. And these photos are wonderful. 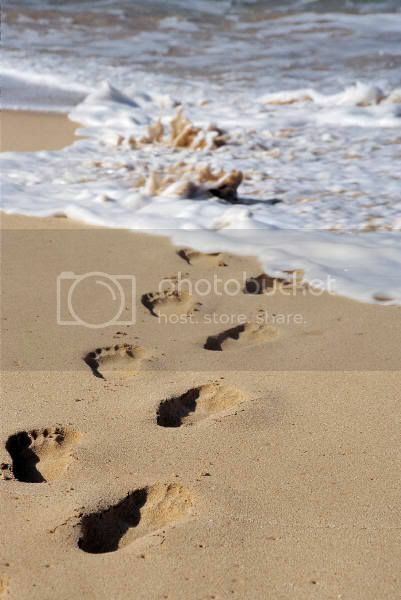 Anyone could learn how to do this from your photos. 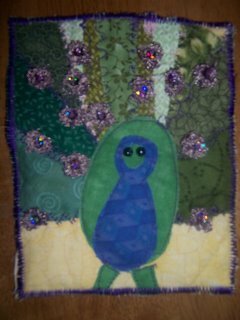 What a clever way to use scraps of fabric! This is a great instructional post. I like the way, by chance, the very center yellow square looks like a duck.